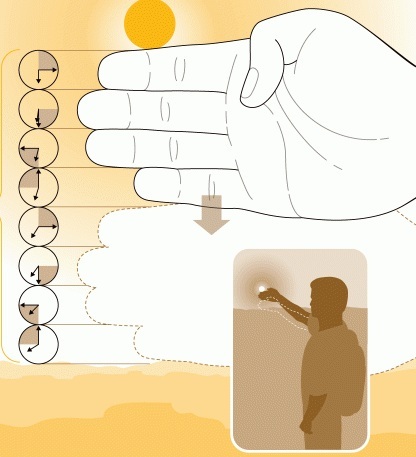 Did you know, estimating sunset time with the help of your fingers is really very easy. This is one thing every person going for a trek should remember. I know you have smartphones which tell you the exact sunset time these days. In that case, learn it to show it off to your friends. By the time their smartphones come out of their pockets, and get unlocked, you’ll have an estimate ready. Stretch your arm as much as you can and count the number of fingers that can come in between the sun and the horizon. That’s it. Each finger is about 15 minutes of remaining sun time. If four of your fingers, or one hand fits there, you can directly say that it’s one hour to sunset. Another thing to note is – where you are on Earth roughly. Good news for people near the equator. The estimate near the equator is very close to 15 minutes per finger. However, for people trekking nearer to the poles, you might have more time than what you just estimated using this technique. Very near to poles, it is a completely different story. When pros have 2 hands (8 fingers or 2 hours) of time left for sunset, they start searching for a shelter to spend the night. But again, smartphones can give you really an accurate time. This simple farm trick, like the one I shared a few days back – telling temperature with cricket sound. It is just a rough estimate. So make sure you don’t completely rely on this to get back home before it gets dark.